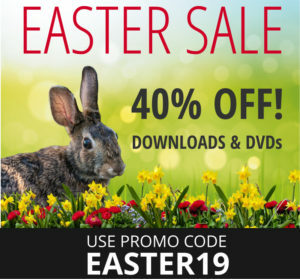 Buy All 5 and Save! 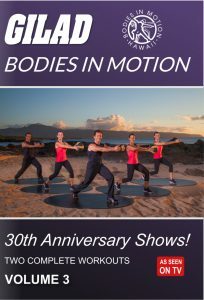 Over the last 35 years ‘Bodies in Motion’ has been the official daily workout for millions worldwide! 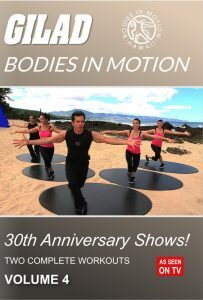 In this 5 DVD series, we celebrate 30 years of health, fitness and fun. 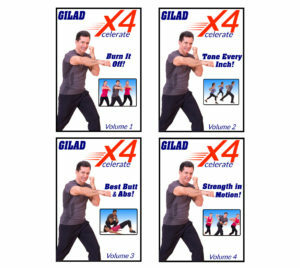 Gilad brings back many fan favorites and introduces us to some new team members as well in these new workouts. 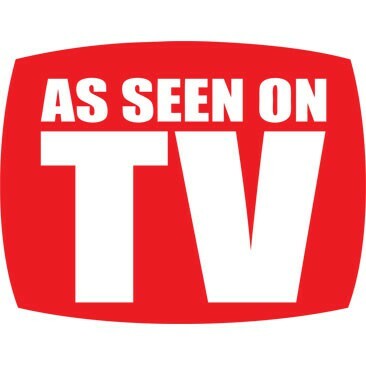 Over the years many inspiring success stories from viewers have made our work very rewarding. Thank-you for trusting us with your bodies. You’ll find a description of the workouts under each title below. 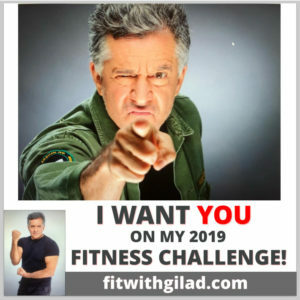 SHOW 1 – This is the first of Gilad’s 30th anniversary reunion shows featuring long-time team members Kent, Trella, Falicia and Wendee. These shows were shot on the North Shore of Oahu at Shark’s Cove. 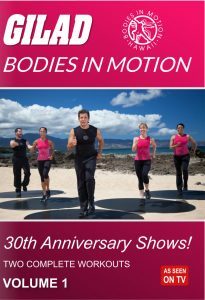 SHOW 2 – Kim and Maelita first appeared on Bodies in Motion in 2001. 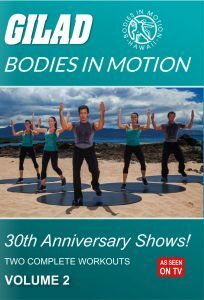 Emily first appeared on ‘Bodies in Motion’ in 1983 at the age of 10. SHOW 3 – All of Gilad’s 30th anniversary shows were shot on the beach at Shark’s Cove on the North Shore of Oahu. 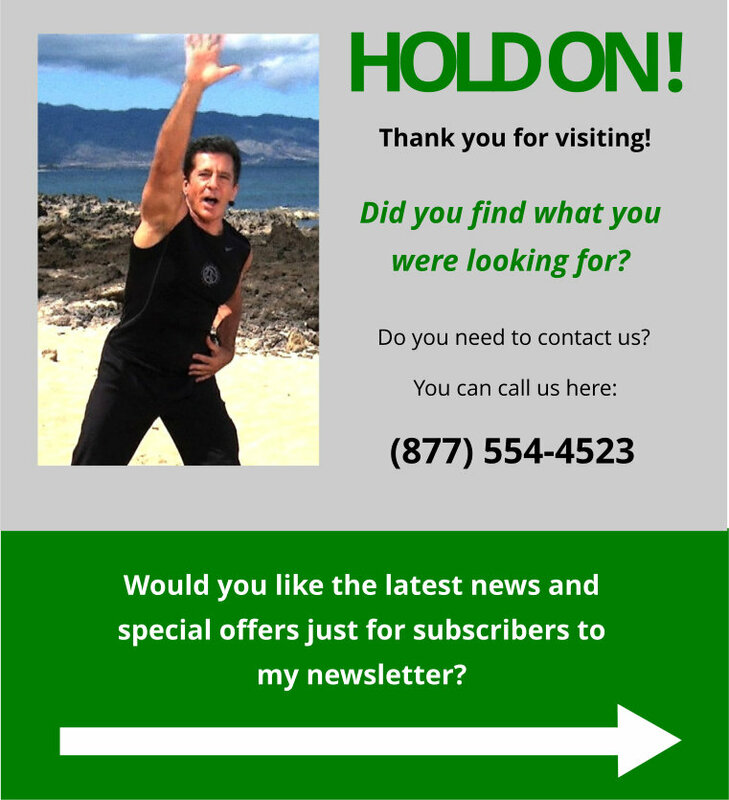 In this show Gilad is joined by Kim, Leslea, Wendy and Bryana by the lava rock coastline. Warm-up – Cardio – Hips, Thighs & Buns – Abs – Stretch. SHOW 4 – Gilad is joined by Emily, Maelita, Kent and Sylvia. There is a clip of Emily on the show from 1983 when she was 10 years old. Warm-up – Cardio – Upper Body – Abs – Stretch. SHOW 5 – Gilad is joined by Trella, Kim, Bryana and Wendy at scenic Shark’s Cove on the North Shore of Oahu. You will see a clip of Trella from the show in the 1980’s. SHOW 6 – Gilad is joined by Kim, Maelita, Wendy and Leslea. This show features some heavy ball training for the shoulders, arms and core. 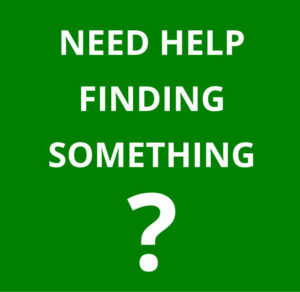 A small hand weight can be substituted for the heavy ball. SHOW 7 – Gilad is joined by Trella, Kim, Wendy and Sylvia in this episode from Shark’s Cove on the North Shore of Oahu. 21 MINUTES SHOW 8 – Gilad is joined by Steve, Bryana, Leslea and Maelita. The cardio segment consists of shadow boxing and a little karate. SHOW 9 – This is Gilad’s 9th 30th-anniversary reunion show at scenic Shark’s Cove on the North Shore of Oahu. In this episode, they use heavy balls or small hand weights during the Cardio Core segment. ALL LEVELS – 21 MINUTES SHOW 10 -In this show, you can see rain squalls in the distance. Gilad and the team use heavy balls or small dumbbells during the floor work for extra resistance.